Any holiday centered around preparing and consuming abundant amounts of food is right up my street. In the United States, this holiday is Thanksgiving, and in the UK it’s Christmas. I love to cook for my friends and loved ones, and I consider my job well done when, after the meal, the people I have fed flop and groan like sunning walruses. I have my tried and true methods (brined and convection-roasted turkey, always) and my favorite recipes (cornbread, apricot, and chestnut stuffing, and—I’m not ashamed to admit it—the Karo corn syrup pecan pie). Lately, however, my circle is expanding to include more non-meat eaters. Three years ago I was responsible for the vegan main at a Christmas dinner in London and this year, for the first time, more than half of our Thanksgiving table is vegetarian. I hate the thought of the vegetarian at a table of meat eaters feeling like an afterthought. The ‘you can eat the side dishes, that’s enough food, right?’ approach is both depressing and insulting. And mains intended to imitate the meat everyone else is eating (i.e., the dreaded Tofurky) are just plain depressing. So, over the next month (and especially over the next week), I hope to make and blog a number of tasty vegetarian dishes, hopefully to supply inspiration for your Thanksgiving (and Christmas) table. But wait! This first dish is not a main dish, it’s a side. Well, a couple of weeks ago, I had a marvelous meal with homesick London ex-pat friend J at Rock Creek restaurant, in Seattle. We were both surprised and delighted by one of our starters. From the menu description we expected a standard-albeit-tasty roasted cauliflower dish. The dish, however, was more like a salad and it was one of our favorites of the night. This is my effort to recreate it. Shaved cauliflower is tossed in a tart vinaigrette and served with farro, toasted pine nuts, and plenty of fresh herbs. The component parts are prepared separately and retain distinct flavors, creating nice contrasts. I’ve added dried barberries (tiny sour berries featured in Iranian cooking), for extra brightness. Barberries are delicious, but they can be hard to find. Feel free to substitute dried currants, if you prefer, and I encourage other substitutions as well, for example, chopped toasted hazelnuts or pistachios instead of the pine nuts, or toasted slivered almonds. Optionally, one can top the salad with shaved pecorino romano. Without it, it’s delicious and fully vegan. The dish is nutty and autumnal and perfect for Thanksgiving. After experimentation, I offer you my preferred method of making farro. Some people claim it’s not necessary to pre-soak farro. It may not be necessary, but in my opinion, it’s the better course. 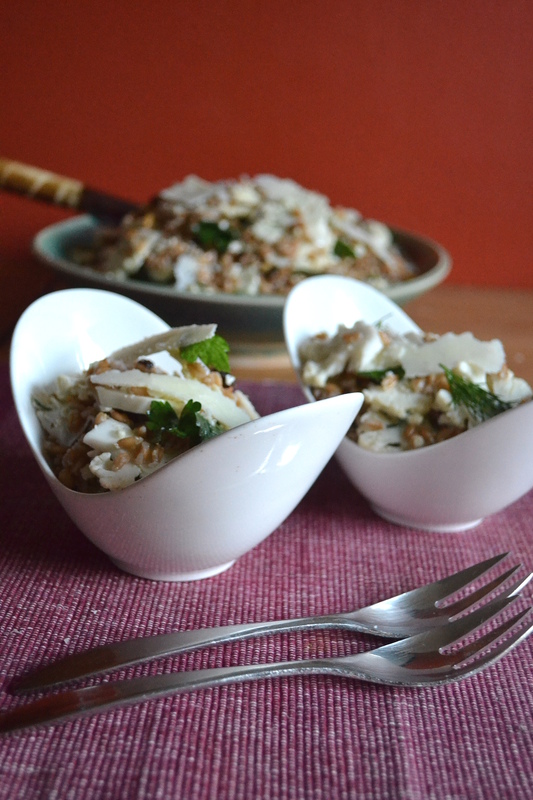 I find that when farro is cooked straight from dry the grains burst and can become mushy. Soaking allows the grains to gently plump up, while remaining intact. Then the cooking time is greatly reduced. 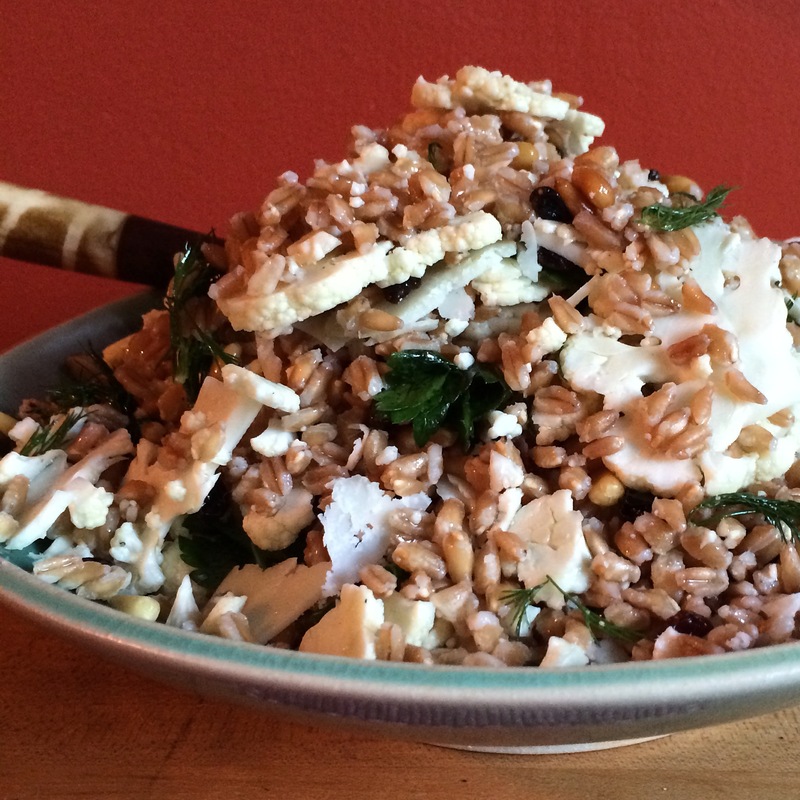 The result is farro with that perfect restaurant consistency. Pre-soaking isn’t daunting. It’s easy enough to pop the farro in a bowl with some water in the morning, and then finish the dish shortly before you intend to serve it. 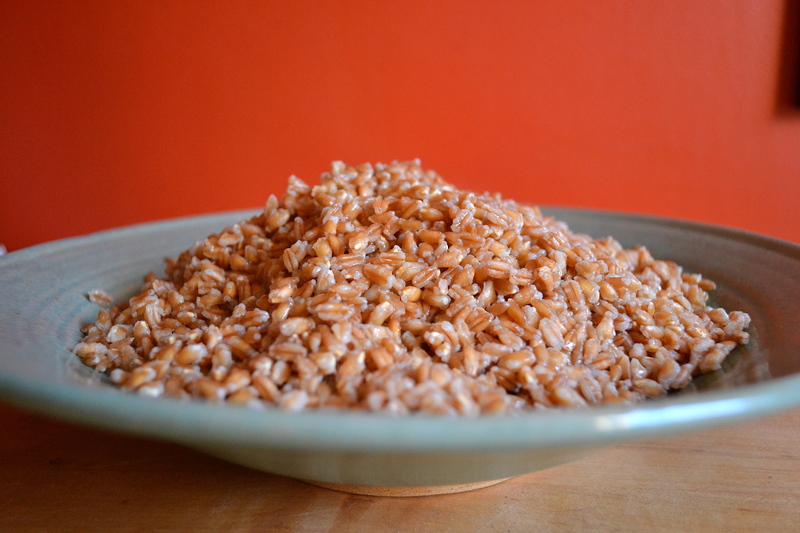 Soak the farro in enough water to cover for at least three hours and up to overnight. (While the farro is soaking, you can prep the other ingredients.) Rinse farro well in a sieve until water runs clear. Combine the farro, three cups of stock or water, and two teaspoons salt in a heavy bottomed pot with a lid. Bring to a boil, cover, and reduce heat to medium-low, and cook for ten minutes (timed from when the water starts to boil). Drain any excess water and rinse again with cool water to stop the cooking. Transfer to a bowl or large dish and toss with one tablespoon of olive oil. Combine the cauliflower and dressing and marinate for at least thirty minutes and up to three hours. Combine the parsley, dill, and salt water and soak for at least thirty minutes. Before adding to the completed dish, drain out the salt water but do not rinse the herbs. To finish: toss the farro, cauliflower and dressing, salted herbs, nuts, and berries, being careful not to break the delicate cauliflower florets. (I use my hands.) Taste and adjust seasonings as desired. If using, garnish with shaved pecorino. Serve at room temperature. Makes 10-12 generous servings, more if it’s one of many sides. This entry was posted in Recipes, Side Dishes, Starters, Vegetarian and tagged barberries, cauliflower, Christmas, Dill, Farro, holidays, parsley, Photography, Pine Nuts, salads, Thanksgiving, vegan, vegetarian by Susan. Bookmark the permalink. That looks great! I haven’t been to Rock Creek yet but I’ve heard good things – maybe I’ll hit it the next time I make it up. Until then, I’ll have to give this version a shot. I love me some farro! Rock Creek is a great place! I’m slow on the uptake and didn’t realize that you were back in Seattle. Welcome back! Everybody should have a salad like this in their repertoire. Relatively easy to make and very popular at potlucks or holiday dinners! I’m curious to see what you come up with for a veggie main course dish. PS. Now that you’re back in the Emerald City, check out Porkchop & Co. in Ballard. Paul, in addition to being a swell guy and possessing the ability to cook up a mean pork chop, has some of the most interesting vegetarian options in town. The man can just flat out cook!